Now that we have safely arrived in New Zealand, I can make the following post about the tropical disturbance experienced in the Fiji-Tonga region on November 6-8 without worrying my family. We are here in the Ha’apai Group of Tonga, preparing to head southwest to New Zealand. Our first tropical depression has just passed over us and is moving away to the southeast. Although it was a cyclonic (rotating) storm, the winds did not reach cyclone intensity and the storm was not named. The Ha’apai Group has little protection from westerly winds, so different strategies were employed by different vessels to avoid the storm---which would eventually expose us to westerlies. 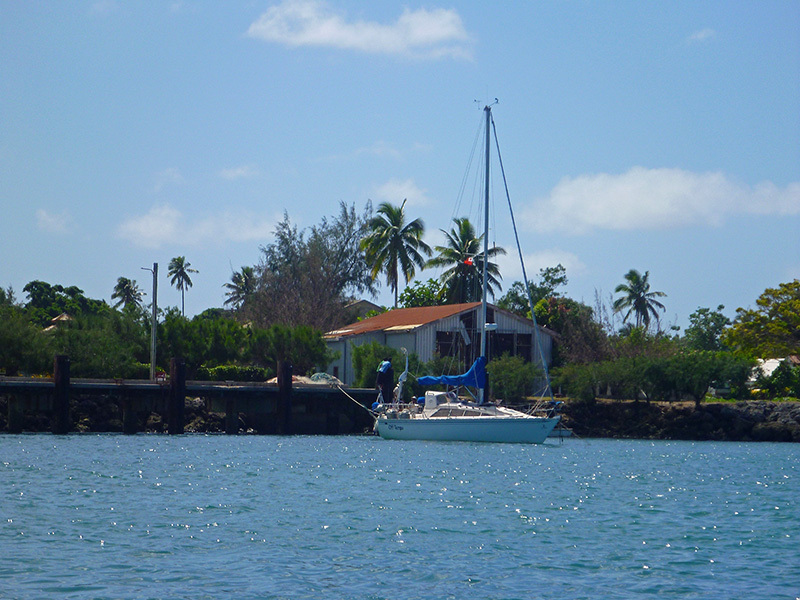 A few boats turned around and traveled the 70 miles back to the protection of the safe harbor in Neiafu. 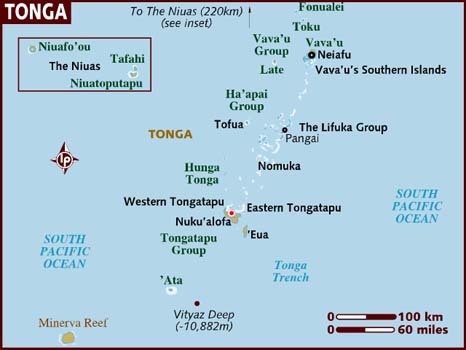 (Some vessels as far south as Tongatapu did the same, and some boats that had already left for New Zealand turned around and went back to Tongatapu for shelter.) Four boats here in the Ha’apai managed to squeeze into the small boat harbor at Pangai by Med (Mediterranean) mooring (tying stern-to the shore and dropping an anchor forward.) One of these boats had to shorten its anchor chain after dragging, when its steering vane rudder banged into the rock wall at its stern, and all the boats in the harbor maintained anchor watches through the night as the crowded harbor allowed no room for error. 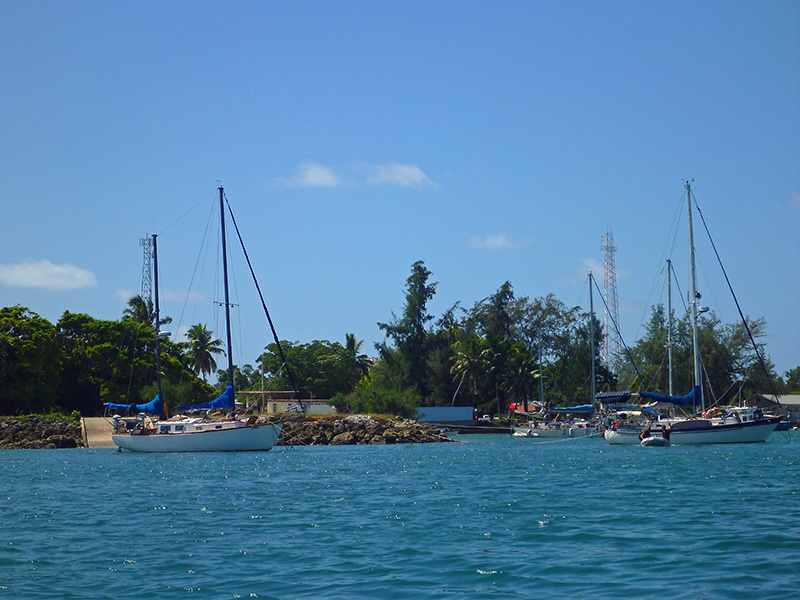 Another vessel, arriving at Ha’apai late in the day, set their anchor in the anchorage outside the harbor. This boat had the least protection and the most difficulty. Their anchor dragged; they set a second anchor; their snubber broke and finally, their second anchor dragged. They ended up turning on their motor and motoring forward to take the strain off the anchor chain. They managed to hold position this way until the worst of the wind backed off. Then, they moved into the inner harbor with the other four boats. Because we felt that the harbor was too crowded and would be unsafe, Patrick and I traveled six miles south in Silhouette and anchored in the protection of a sand cay off Tatafa Island (http://goo.gl/maps/AUGJS). There, we received the full force of the wind but were protected from the waves in three directions (including the west) by the cay and by the islands and reef to the east. The bottom was sand and grass with excellent holding and we only set a single anchor, which---in retrospect---was probably a mistake. 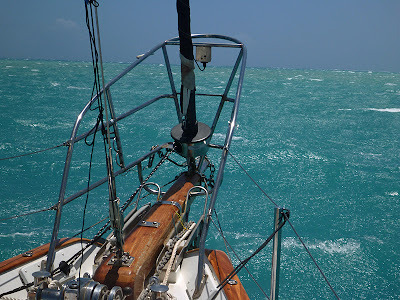 We knew the winds were going to clock around, and we were trying to avoid having two anchor chains crossing over each other and getting tangled. 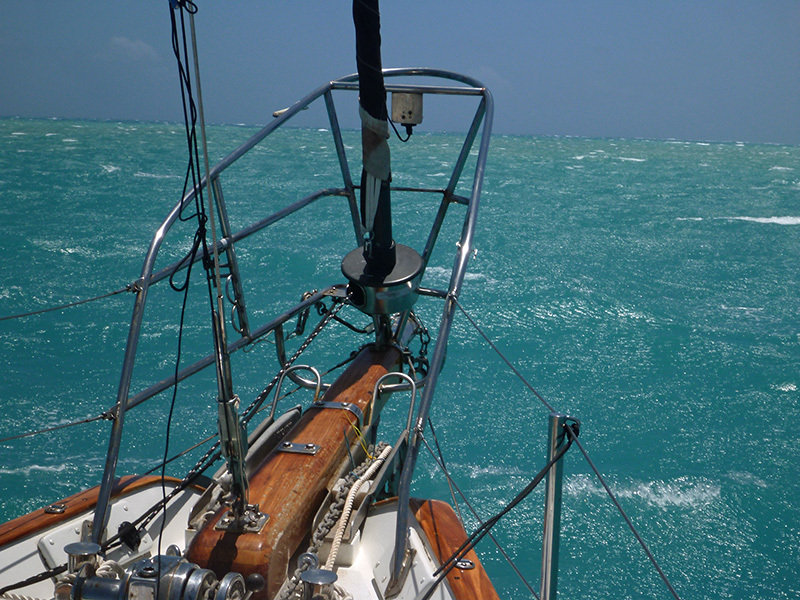 In the end, our anchor held, but the maximum wind gust we saw was only 35 knots. If we had gotten the 50+ knot winds received elsewhere, it might have been a different story. (Skipper's Note: We did, however, have a second large anchor at the ready and could have deployed it in moments if required.) Our lowest barometer reading was 999 hPa (hecto-Pascals), which indicates that we were in the center (eye) of the low and not in the direct path of the strongest winds. However, we did receive sustained 30 knot winds for hours on end on November 8. 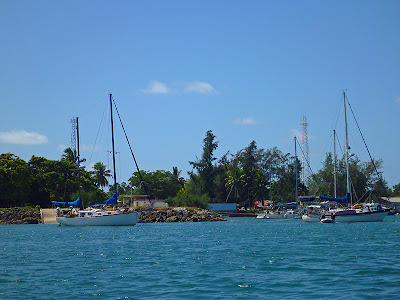 North of us, back in Neiafu, boats at anchor reported wind speeds of 40 knots accompanied by lightening. At the sand cay off Tatafa Island, the sky was constantly illuminated by lightening during the night of November 7, but we received no bolts and only distant thunder. Overall, those of us at anchor near land fared better than those at sea. Depending on where they were in relation to the path of the cyclone, different boats experienced different conditions from three to four meter seas in 25-30 knot winds to five to ten meter seas in 40-50 knot winds. Gusts in the 70 knot range were reported both at sea and further south in Tongatapu. Many boats at sea en route to New Zealand sustained damage. One boat lost its forestay. On another vessel, ports broke and had to be boarded up in order to avoid the intrusion of sea water into the cabin. We heard several boats report that they blew out their stays’ls (the sail often employed during rough weather), including one that also lost their propane tank and their ability to prepare warm food. Another boat’s autopilot broke down. But the worse situation encountered by any crew was when the boat Windigo rolled. The first report we heard stated that the crew of two (whom we had chatted with several times in Neiafu) had boarded their life raft. Fortunately, this turned out not to be true, and the report was later amended to say that the crew had stayed onboard their vessel but had sustained injuries. We heard over the radio that at least one person on board had a concussion. The nearest vessel to them in the fleet, Adventure Bound (a more sturdily built vessel than Windigo) turned around and started bashing back to weather in horrendous conditions in order to assist the disabled crew. A New Zealand Navy ship and a commercial vessel were diverted to the scene to attempt a rescue. During this time Adventure Bound was asked to stand by until they arrived. New Zealand aircraft were also on the scene monitoring the situation and providing updated position reports throughout the ordeal. Windigo was too far offshore for a helicopter to reach and effect a rescue. After arriving at Windigo’s position, Adventure Bound reported observing a total of six aircraft flying over. Obviously, no resources were spared in coming to the aid of the injured crew. Thankfully, both Windigo and Adventure Bound crews survived the ordeal. Windigo’s crew was rescued and transported to New Zealand for medical care. Windigo was not scuttled---perhaps its crew will be able to salvage it at some point---and became a navigational hazard for the rest of the southbound fleet. The position of the drifting hull was widely reported over the radio. 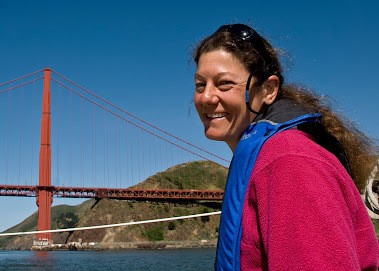 The assisting vessel, Adventure Bound, sustained damage of their own when they came to the rescue: Their wind vane steering mechanism broke and they lost their wind generator. When the rescue was complete and the Windigo crew was receiving medical attention, the Adventure Bound crew wisely hove to and rested up before contemplating their next move. 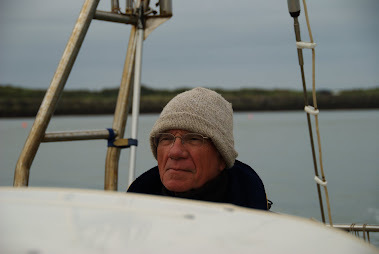 After over 36 hours partly spent traveling to the scene, engaging in endless radio communications with all parties involved, and standing by at the scene should he and his shipmate need to attempt the rescue themselves, the exhaustion was evident in the voice of Adventure Bound skipper, Bruce. Bruce joked over the radio that he was going to change the name of his vessel to a more delicate-sounding name like Ladybug* so he wouldn’t be called upon in this manner again. Another skipper on frequency suggested instead the well-earned epigram of Homeward Bound. Truly a job well done, Adventure Bound! It was very heart-warming to follow the drama at sea from a distance as the cruising fleet pulled together---with the help of Gulf Harbour Radio and other Ham operators---to support the vessels that had the misfortune to be underway during the tropical depression.